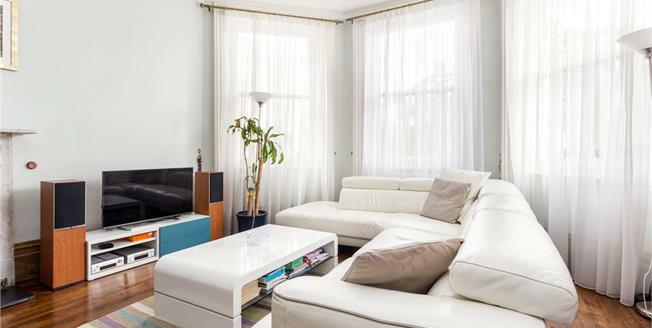 Offering bright, modern interiors is this first floor apartment situated in a grand period building in a sought-after area of West Hampstead with very convenient transport links. With an impressive wide entrance hall with wooden floors and entry phone, the property retains grand period features with high ceilings and rooms of generous proportions. It comprises a spacious open plan living area, a master bedroom with en suite shower-room, two further bedrooms and a stylish bathroom. The apartment has been updated with a beautifully designed kitchen with granite worktops and integrated appliances. The beautifully appointed en suite and bathroom both feature stylish wall-mounted basins with storage and bidets. There is on-street parking (permit required) and nearby are the plentiful amenities of West Hampstead including a wealth of shops, bars and cafes. Within close proximity are three stations at West Hampstead offering easy access to Thameslink, Overground services and Underground (Jubilee line).